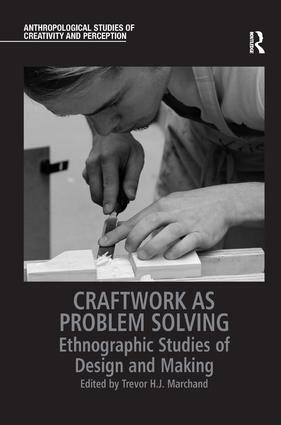 This volume brings together a cross-disciplinary group of anthropologists, researchers of craft, and designer-makers to enumerate and explore the diversity and complexity of problem-solving tactics and strategies employed by craftspeople, together with the key social, cultural, and environmental factors that give rise to particular ways of problem solving. Presenting rich, textured ethnographic studies of craftspeople at work around the world, Craftwork as Problem Solving examines the intelligent practices involved in solving a variety of problems and the ways in which these are perceived and evaluated both by makers and creators themselves, and by the societies in which they work. With attention to local factors such as training regimes and formal education, access to tools, socialisation and cultural understanding, budgetary constraints and market demands, changing technologies and materials, and political and economic regimes, this book sheds fresh light on the multifarious forms of intelligence involved in design and making, inventing and manufacturing, and cultivating and producing. As such, it will appeal to scholars of anthropology, sociology, and cultural geography, as well as to craftspeople with interests in creativity, skilful practice, perception and ethnography.